Recently, I made some discoveries. First, it took me sixty years, but now I know that I hate big chunks of potatoes in soup. On the other hand, a larger revelation is just how much I enjoy visiting “living history” farms, historic houses, and preserved landscapes and lands. I fall a little bit in love with every place’s history. I imagine myself being one of those ancestors whose were determined to survive and thrive yet always seemed to bring beauty into the picture. Naturally, I also invariably conclude that I would have keeled over early from cold, outhouse, traversing never-ending mountains and canyons, and too many damn potatoes in the soup. Unless I were Queen, which in my case seems likely, whereupon I would have thrived. After all, I love cake. And I would have been carried everywhere. I was reminded of my passion for living history farms when I opened the mail two weeks ago to find a precious gift–a middle-school children’s book written by my friend, Anne Brack Johnson. Anne is married to Jerry Johnson, who some of you may know because he is the erstwhile, intrepid, and longtime Executive Director of Garfield Farm and Inn Museum in LaFox, Illinois, which is just west of Geneva. Near St. Charles. Not as far as DeKalb. Twenty years ago it was cornfields and now it’s changed to McMansions and Meijer’s Grocery stores every mile. But nestled in the middle–like a time machine–is delightful Garfield Farm. 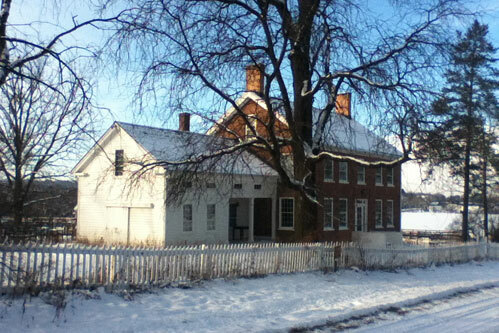 Garfield Farm is a treasure dating to the 1830’s. 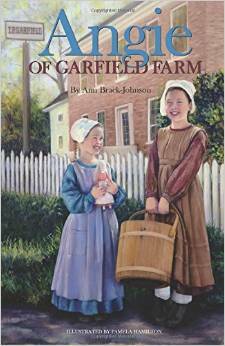 Anne’s book, Angie of Garfield Farm, is based on a little girl who was an actual Garfield family member. This pioneer family was smart enough to save EVERYTHING (diaries, tools, buildings) for posterity. And even luckier for us, the more recent residents of the LaFox area have been wise enough to donate money for Garfield’s preservation. The brick house–once a tavern on the route west–the barns, the sheds, the oxen, the way of life…they are all there for you to experience. Please do visit and become members. I try not to miss the Rare Breeds Show in May, but if you would like to learn about restoring an 1842 (!) barn, sign up for the restoration seminars on February 14. One of my favorite–and certainly most enthusiastic–gardeners will be at Garfield on March 22. Vicki Nowicki is not to be missed. She will be giving a seminar called, “Historic Perspectives on Organic Gardening”. Vicki knows more about organic gardening than anyone I know AND she is the “(DuPage) Queen of Organics” through her heirloom vegetable garden design and education business. Sign up! You’ll have the rare opportunity of a wonderful, romantic venue and a wonderful learning experience. love this. you are ALWAYS a breath of fresh air! Rommy, Things I know about you….. Your grandparents were potato farmers! Now that’s ” living history”! NO, chunks of potato in soup, not even after being in a hot fire!